The present Revolution in Egypt serves as a prelude to more uprisings in the other Arab countries, a senior commander of the Islamic Revolution Guards Corps (IRGC) said on Saturday. 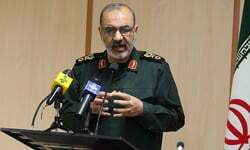 “Egypt is the heart of the Arab world … therefore any political changes or sociopolitical revolutions in Egypt could occur in many other Islamic countries,” IRGC Lieutenant Commander General Hossein Salami told FNA. “This is what comes of hegemonic systems dependent on foreign [states] that start a dictatorial movement n their country,” the commander added. Emboldened by the recent popular revolution in Tunisia, which put an end to the 23-year-long reign of the country’s President Zine El Abidin Ben Ali, Egyptians have marched in several cities since Tuesday to bring an end to Mubarak’s three-decade rule. On Saturday, thousands of anti-government protesters have returned to the streets in Egypt as President Mubarak refused to quit. UPDATE: The Iranian opposition leader also released a statement in support of the Egyptian protesters. Iranian opposition figure and 2009 presidential candidate Mir Hossein Mousavi has released a statement in support of the Egyptian protesters and connecting this week’s events in Egypt to the 2009 protests in Iran.